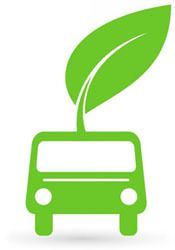 Alternative fuels can be substituted for traditional gasoline or diesel fuels. The federal Energy Policy Act of 1992 identifies six such fuels listed below. Alternative fuels may be used either as a replacement for gasoline or in conjunction with it. All alternative fuels can be domestically produced, and most provide significant air quality benefits when used as a vehicle fuel. Ethanol is manufactured exclusively from biomass like agricultural grain products. E85 fuel is created by mixing 85 percent ethanol with 15 percent gasoline, an industry standard. Vehicles that can run on E85 or gasoline are called Flex-Fuel vehicles. Many auto manufacturers now feature the Flex-Fuel capability as a standard feature. Not sure if your vehicle will run on E85? Just check for a yellow gas cap. While most Ethanol is created from corn products, many researchers are finding ways to create Ethanol from the cellulosic breakdown of native, non-food plants like switchgrass, miscanthus and many others. Currently, South Carolina has over 89 publicly-accessible E85 pumps and almost 10 government fleet pumps.